Though never as popular as the pony truss, the truss leg bedstead was a standard bridge type marketed in the late 19th and early 20th centuries by such national firms as the Wrought Iron Bridge Company of Canton, Ohio. The structure acted as a rigid frame, with its upright end posts extended below the truss to form the supports. This was both the strength and the weakness of the bedstead. The combined super- and substructure reduced costs somewhat, but bedsteads were prey to flood and collision damage and suffered from inherent structural weakness relating to compression stress in the lower chords. As a result, although the bedstead enjoyed a brief popularity in Nebraska around the turn of the century, all but a handful have since been demolished. 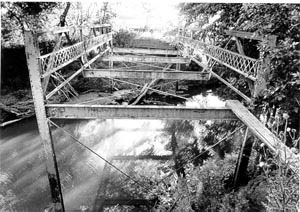 The Olive Branch Bridge is distinguished as the oldest of the remaining bedsteads in Nebraska. It was fabricated and built in 1897 by the Wrought Iron Bridge Company under contract with Lancaster County. Closed in 1987, the bridge has had its floorboards and stringers removed, leaving the skeletal steel superstructure in place.